Blue Forest are delighted to have designed and built 5 luxury tree houses for the Enchanted Village at Alton Towers Resort. 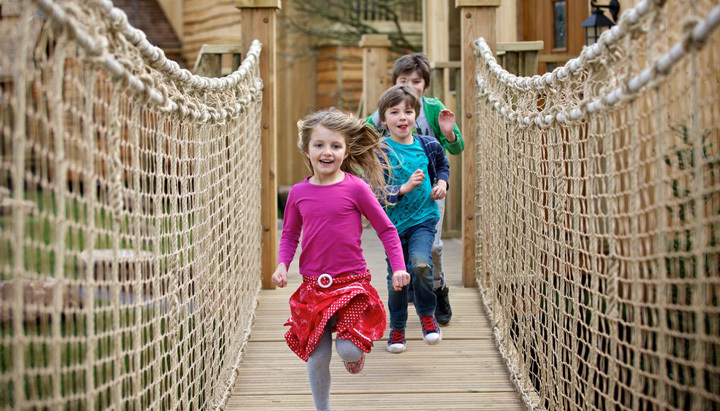 With a strong emphasis on fun, play and adventure, the tree house village is accessible by decked footpaths and rope bridges. 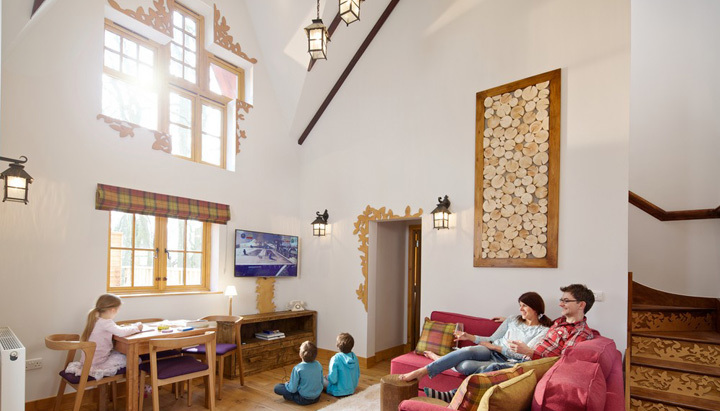 Each tree house sleeps up to 8 people and includes an open plan living space, family and en-suite bathrooms and children’s bunk rooms and sleeping lofts. Secret bookcase doors, turreted towers and twinkling lights add to the magical fairy-tale feeling. The tree house scheme is part of the Enchanted Village resort at the well-known theme park in Staffordshire which includes 120 unique woodland lodges, developed with the aim of increasing it’s foothold in the short-break market. The Enchanted Village is located near a beautiful woodland on what was once an estate belonging to the Earl of Shrewsbury. 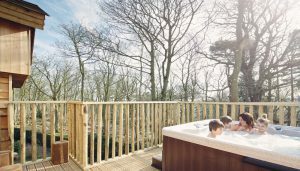 “Alton Towers Resort is located in the heart of the Staffordshire countryside which puts certain restrictions on developments within the park. 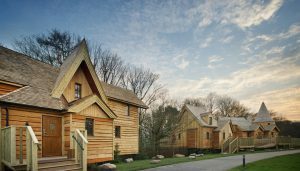 Part of our design challenge was to create a scheme that sympathised with this and camouflaged the accommodation to fit in with the landscape.” Andy Payne, Blue Forest Managing Director. 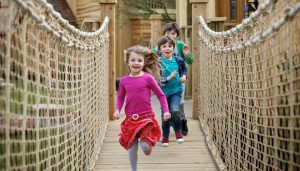 The village also features its own themed restaurant, the Crooked Spoon, a magical toadstool trail, a children’s playground and a high-ropes course called the Enchanted Forest Tree Top Quest. 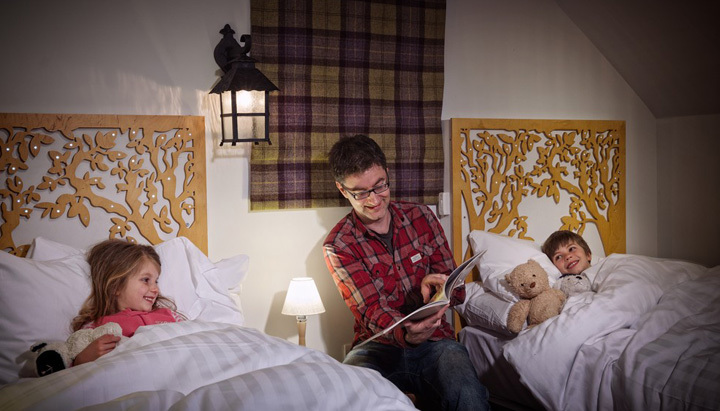 Each of the 5 tree house suites is nestled in the woodland and were described as the villages “crowning glory” by James Ellis and family, the first people to test out the suites for The Times in April 2015. 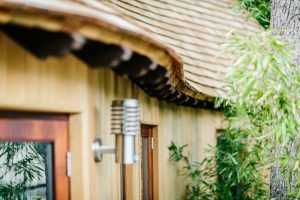 The tree houses themselves have been designed to fit into the surrounding environment with very little impact and are constructed using environmentally friendly building materials and construction techniques wherever possible. “Tourism represents a £1.8 billion industry to Staffordshire and we want to be part of the ongoing growth of that figure through our planned future development. It’s a very exciting concept for us and one that we believe will create real opportunities for the surrounding area.” Mark Kerrigan, Alton Towers Resort’s Development Director. 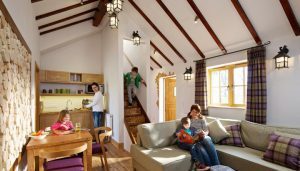 Blue Forest are delighted to have employed the services of Jerry Tate Architects in the development of this scheme. 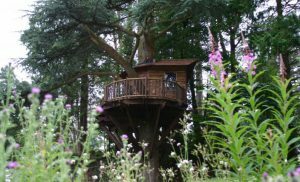 Fancy staying in this treehouse? Click here to be re-directed to our clients website to book! Alton Towers has a range of exciting rides, attractions and themed restaurants for the whole family to enjoy including a spa and golf course. 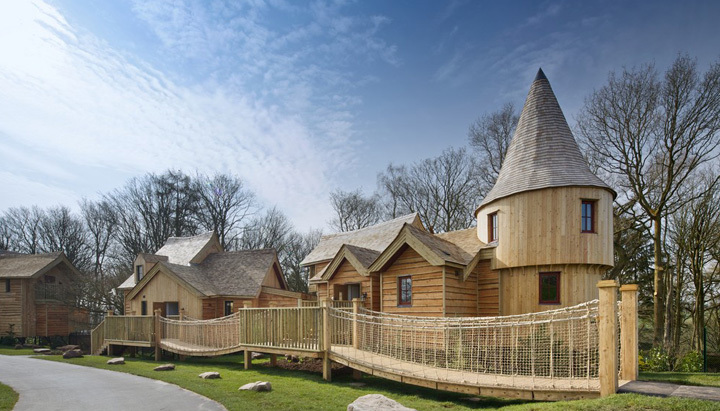 The Enchanted Village has a new treetop assault course, children’s playground and ‘The Crooked Spoon’ themed restaurant. Alton Towers Resort is between M1 and the M6. The three closest train stations are Stoke-on-Trent, Uttoxeter and Derby. A bus service will need to be used for the rest of the journey. The tree houses have a kitchen area which includes a combi microwave, dishwasher, fridge/freezer and tea/coffee facilities.The resort has a variety of restaurants and food outlets. The tree houses have a range of en-suite and family bathrooms, including baths and showers. Tree house guests enjoy VIP parking at the Enchanted Village. Sheltered decked outdoor seating area with a private hot tub. 30” and 50” plasma TVs, games console and free Wi-Fi. 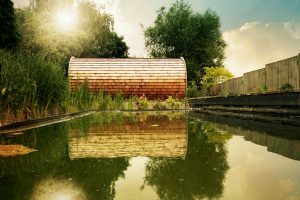 The Whitstable ecoPERCH showcases the combined adaptability and customisation possibilities of Blue Forest’s luxury ecoPERCH designs. 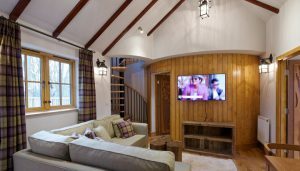 This garden hideaway has been built specifically to provide the client with an additional living space for their property.